Fall in Alaska provides beautiful scenery of gold and red colored mountains, cool crisp weather perfect for hiking, and plenty of wildlife on the move. Bull moose head down to the valleys, and bears fatten up in preparation for winter days ahead. 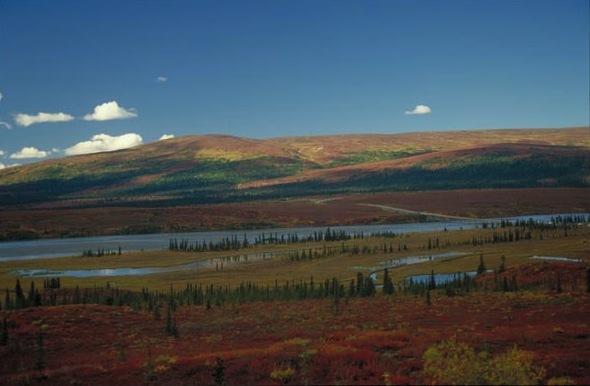 As summer draws to an end up North and gives way to fall, Fairbanks and the surrounding areas put on a spectacular display of red and gold mountains, cobalt blue skies, and earth-toned tundra. The contrasting colors provide an excellent and rare opportunity to photograph some of the most spectacular autumn vistas. For the best chance to see Alaska’s fall colors, visit between late August and early September. Lodges are still open and there are fewer tourists to photobomb your pictures. Fall colors peek at the northern and interior areas first, then move south. For examples of what you’ll see, check out this collection of Alaska fall photos from the Anchorage Daily News.